Dead Ringer (1964) is one of the most delightful scores in the career of legendary composer, conductor and pianist André Previn. A macabre tale of identical twins (Bette Davis)—one of whom kills the other and assumes her identity—the film was given a gloriously over-the-top score by Previn, with notable use of harpsichord for sinister effect. The early 1960s were a time of transition for Previn. A wunderkind prodigy at M-G-M in the 1950s, he won widespread acclaim for his stellar music direction on musicals such as Gigi (1958) and Porgy and Bess (1959). As the '60s arrived, he composed some of his finest dramatic scores, such as Elmer Gantry (1960) and Four Horsemen of the Apocalypse (1962). In only a few years he would quit film altogether, but in 1963-1964 he was employed at Warner Bros. on the music direction for My Fair Lady (1964) and—while that film was shooting—the underscore for Dead Ringer. 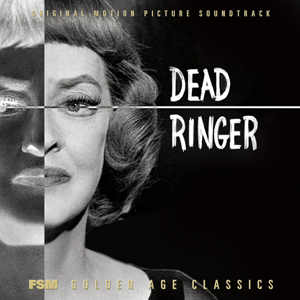 Dead Ringer was a followup of sorts to Bette Davis's comeback hit What Ever Happened to Baby Jane? (1962), in which Davis had starred opposite Joan Crawford. Based on a project that had originated in the 1940s, Dead Ringer gave Davis dual roles as the "good" and "bad" sister in a pair of identical twins—but in this case, it is the "good" twin who finds herself going down a path of corruption and tragedy. From this relatively straightforward premise, Andre Previn hit an absolute home run with his score. Two major themes are present: a jagged, modernistic melody spotlighting strings and harpsichord, used for the determination of the "good" twin to take over her sister's life; and a wonderful homage to Erich Wolfgang Korngold (who scored several of Bette Davis's most famous pictures) in a soaring love theme with uniquely Previn touches. If anything, Dead Ringer features the same sense of gleeful showmanship and symphonic wizardry (and specifically harpsichord) that is found in John Williams's score for Alfred Hitchcock's Family Plot. Both scores seem to live by Hitchcock's reported saying to Williams (and others): murder can be fun. This CD features the premiere release of the complete Dead Ringer score. Tracks 1-13 feature the Warner Bros. Records LP program in excellent stereo sound (remixed from the original three-track 1/2" album master), while tracks 14-21 feature the balance of the score (and source cues) in monaural sound (the previously unreleased music survives only in mono). Liner notes are by Jeff Eldridge. I am writing the blurbs for the next installment of "FSM catalog low quantities and memories" and got to this title... I am trying to be fair in assessing the quality of our projects... some were fan-favorites, others obscure gems, some "archival" in sound quality, etc. Obviously I'm fond of all of them or I wouldn't have released them, but I won't try to pretend they are all the greatest thing since sliced bread. But when I got to DEAD RINGER... this is such a great score! And it BARELY sold! Do you love John Williams's macabre harpsichord style (Family Plot)? This is where it came from. I appreciate that people don't have the money to buy things sight-unseen (or sound-unheard—though we do have ample sound clips) but this is one of the rare CDs where it is delightful and chilling and thrilling and romantic... I feel completely confident in recommending it to all Williams fans, without a doubt. You'll love it. This really is one terrific score. This post inspired me to put it on right now, and it's got everything: it's dark, it's romantic, it's brimming with melody. As you say, times are tough. Believe me, I know. But this is a CD I can't imagine most people here not loving. (To remove the double-negative: I imagine most people here will love it!) What a shame it's barely sold! I'll chime in too; this one's quite lovely. For those of us asking where the melodies are nowadays, the answer is: right here. After 40 years, my LP was nearly worn out, so this CD was a godsend. More than 25 minutes of extra music too. Hell, I've know it was great since I saw it on the late show in 1974, found a stereo copy of the LP at A-1 Record Finders in 1977 , the FSM cd in 2006 and have played it ever since. I am stunned that we have gotten this far in posting and no one --- NO ONE --- including the esteemed Mr. Kendall has seen fit to mention the composer's name---Andre Previn!!! Any score by Andre Previn is top notch and this is no exception. It has been a classic of its type since it was released in the '60s, and it should be in everyone's collection. Symphonic---to creepy (with that ubiquitous harpsichord!!) ---to jazzy. Highly recommended! Lukas, when are you going to post the next installment ? Next Monday?